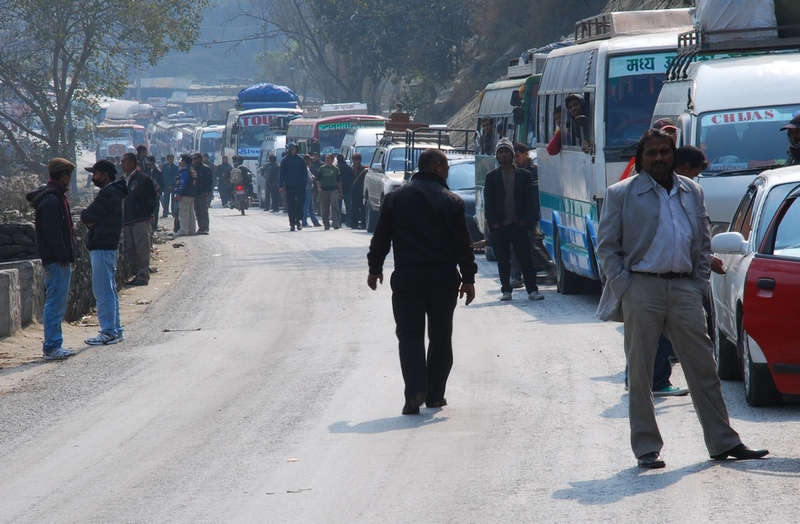 Feb 27th, 2010 - Rich arose at 5:45, gathered his belongings, and headed off to the bus depot near Thamel in Kathmandu. 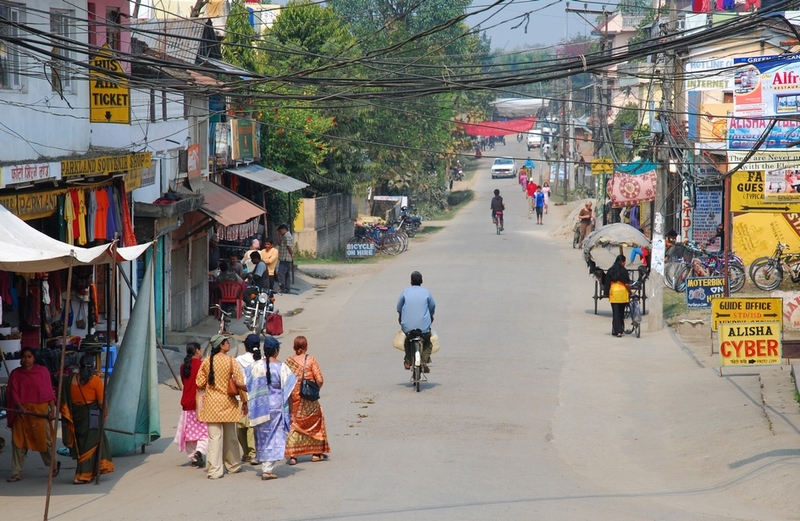 Destination: Sauraha, on the outskirts of Chitwan National Park. His expectations for this trip were not particular high as his impression of the area was that of a touristy zoo-like wonderland. However, tigers (the viewing of which has recently taken on the form of an obsession for our protagonist) can be found within its boundaries so he thought he would give it a shot. 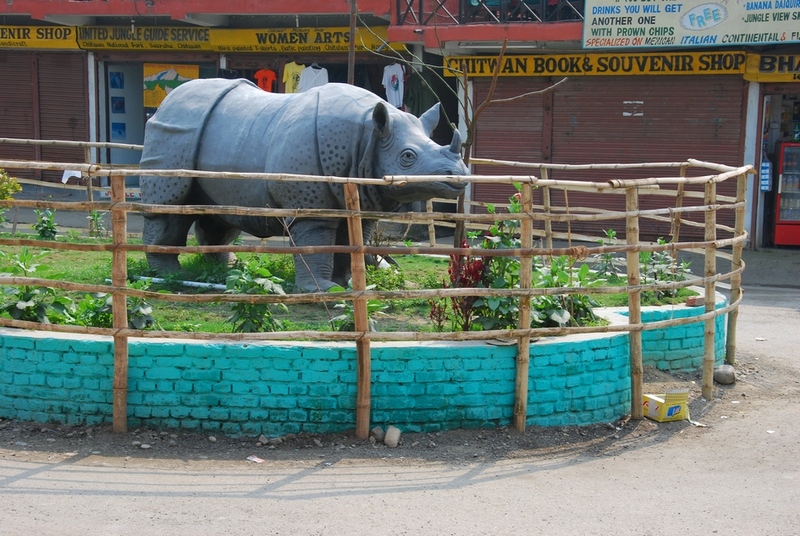 Rhinos also abound and since he'd never seen one in the flesh he found the possibility of making one's acquaintance intriguing. 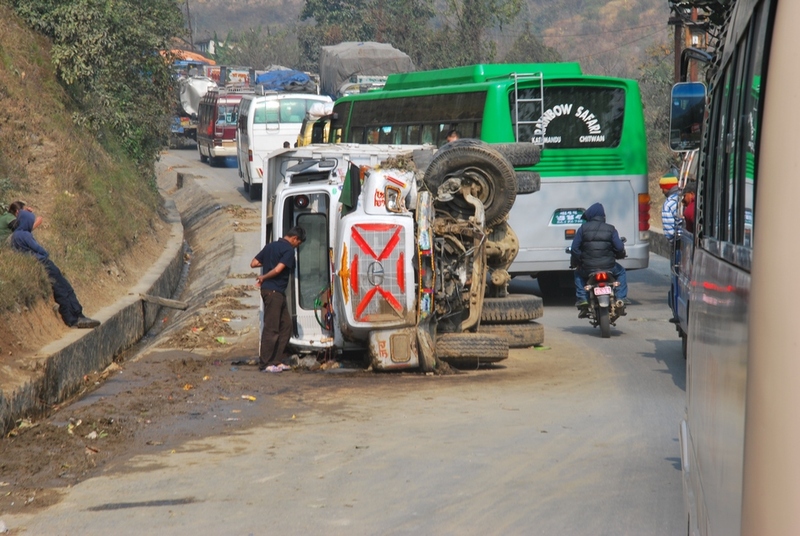 The bus journey was a less than auspicious beginning as the traffic was jammed due in no small part to the narrow mountain roads and the presence of more than one overturned vehicle. 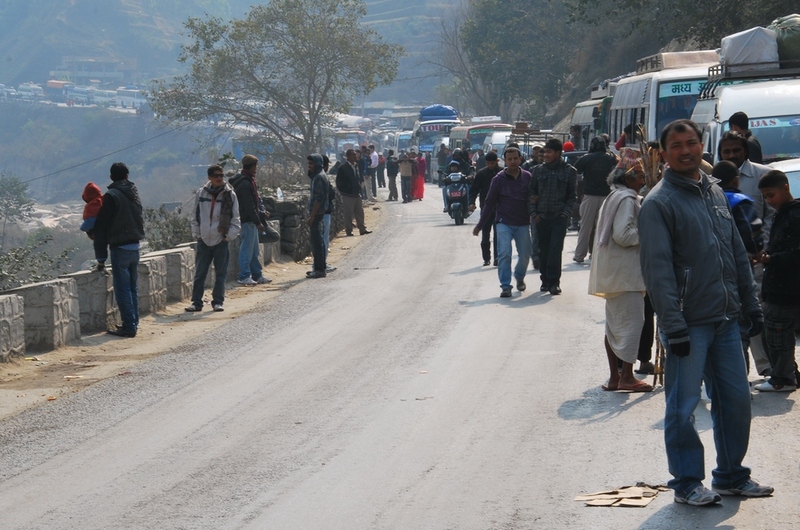 Vehicles were at a standstill at many points along the way. He knew this to be part and parcel of travel in this country but it was still a bit trying as a six hour journey turned into eight. He sometimes finds internal screaming cathartic. This time was no exception. When he arrived he was greeted by a friend of a friend he'd befriended in Kathmandu. The man's name was Raju and came highly recommended by Rich's contact in Kat. He was assured that Raju was a decent bloke and was not looking to cash in on tourist dollars, only to meet and befriend new and interesting people. Upon first hearing the name 'Raju' a shiver of foreboding crept its way up his spine. While traveling in the mangrove forest of southern Bangladesh, known as the Sundarbans, he came across the name before. In that instance it represented the name of a gang of pirates that used the labyrinth of channels as a staging area for raids and thieving operations. As it turned out Raju from Sauraha had a bit of pirate in him as well. Rich was happy to have a ride waiting for him and graciously accepted a spot on the back of Raju's motorcycle. 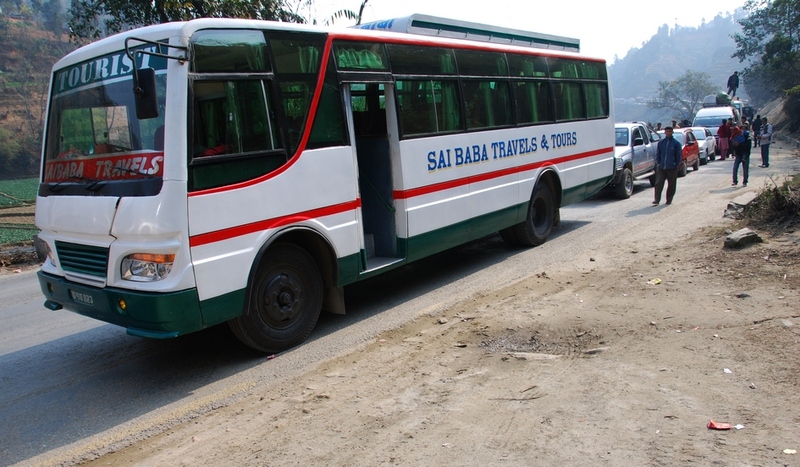 He was taken to a hotel in Sauraha. As our hero did not specifically request the hotel his suspicion alert was triggered. He thought to himself, Where art thou taking me? Chitwan Safari Lodge to be exact. The place was run by Raju's chum. Rich was assured that the hotel was a good one. Upon first glance he was not so sure but after speaking to the owner and receiving a discount (cost of the room: about $4) he decided one night would not hurt. The Lonely Planet described the owners as 'friendly' and although he sardonically thought, the LP is never wrong, he figured he was probably ok. Besides, what could one night hurt? After a welcome tea from the owner, a man by the name of Chandu, a conversation ensued about the prospects of a jungle adventure. Chandu boasted that he'd been guiding tourists in Chitwan for twenty-two years and was 99% sure about seeing a tiger in the park, especially if one was willing to trek within its boundaries for three days or more. As Rich was to discover this was nothing more than the twaddle of a drunken braggadocio. Although he thought the assertion was preposterous he was delighted to at least encounter a modicum of optimism, even if it bordered, if not crossed over, into the domain of Don Quixote. This was in stark contrast to the 'no-way-in-hell' pessimism he'd recently experienced in the Sundarbans of Bangladesh. Rich then sat down to have some tea and speak a bit with Raju while Chandu attended to some business. The conversation was strained as Raju's English proficiency was a bit lacking. He did discover that, like himself, Raju had spent some time working in Iraq, albeit in a different area (Rich in Baghdad, Raju in Balad). Rich was intrigued by this as he had met many people from varying parts of the world working on the military installation where he was stationed on the outskirts of Baghdad to include India, Bangladesh, the Philippines, Uganda, Sri Lanka, Ukraine, and Nepal. He explained to Raju that it was cheaper to hire folks from these countries for some of the more mundane tasks (cooking, laundry services, fuel pumping, etc.) than it would be to employ American citizens. Rich long viewed this as the military industrial complex's version of cheap immigrant labor. Raju was paid a mere $700 a month. Rich had discovered long ago that salaries for these types of positions vary dramatically and are determined by the local company (i.e. subcontractor) doing the hiring (in this case Nepali). The US government makes contracts with KBR (the main provider of ancillary type services on military installations in Iraq and Afghanistan) who in turn contracts out certain facets of its responsibilities to other companies based abroad. In all likelihood the Nepali company hiring Raju probably received $1500-$2000 per month for his services but only $700 found its way to Raju's pocket. Such exploitation was not uncommon but tolerated because as one might expect this is still substantially more than can be earned in their home country. No one Rich had ever met seemed to be displeased with their lot. Richie-boy made the colossal blunder of sharing his salary during his stay in Iraq but attempted to counteract its effects by explaining the money was spent repaying the rather substantial, if not altogether ludicrous, school debt acquired after seven years of education. Still, the self-reproach repeatedly echoed in Rich's head in the form of You're an idiot. A big, fat, stupid idiot. Slap yourself. Slap yourself hard. After the conversation Rich could not be sure what was actually understood but thought it was safe to assume that Raju probably believed him to be King Midas. Another conversation ensued with Chandu and a three day itinerary was agreed upon. Fees for guide services and park entrance fees would be paid up front but lodging and food would be paid along the way. Although the price was a bit higher than the common 3 day/2 night package tour Rich believed that the extra expense would be well worth it. He was not without a healthy amount of skepticism. In reality he was not entirely sure what was happening or if he was in for a fleecing but this was nothing new. He has long understood that in some ways one exists in a perpetual state of ignorance in these situations. Rich decided to chance it. Rich would have his regrets.